I had to lookup what "Golden Rivet" means... I wish I hadn't. I feel I've lost my innocence. I would totally buy a "Brony" soap. Had to look that one up to. rather funny, sort of, maybe, not really. It would actually be a great name, as in 'Finally found the Golden Rivet' In a fruitless search meaning, not so sure about the relevance to that rather disturbing second meaning. I don't know that old spice is the scent profile for the brony soap.. we will need to confer with people much more fabulous than ourselves. INNOCENCE??? Yeah right! That Navy meaning of "Golden Rivet" could also be called "SOAP ON A DOPE!" "What's the theme you're trying to put across? Have you got a label design I could check out and then may be able to give you something that relates directly to the design? The label hasn't been designed yet - I will create something based on the winning name. The theme - basically as mentioned in the original post, something with a naval or nautical theme. 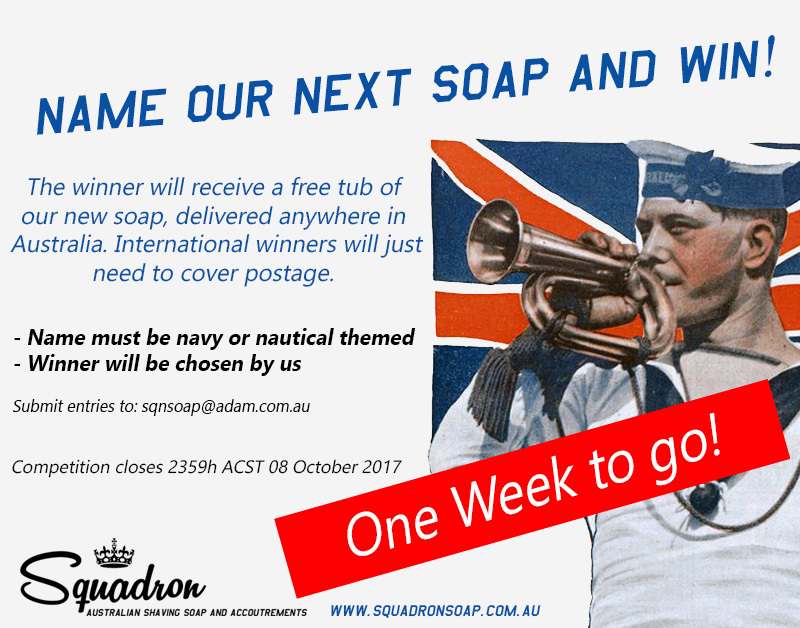 I will entertain all entries submitted, but as everyone knows, the theme of Squadrons overall brand is Commonwealth Forces around the 2nd World War era. But like I said, I'll seriously consider all submitted entries, regardless of era. Here's some suggestions Andy. Sorry if any double up on others already. Frankly, although I, in my Army days, bagged Sailors for all I was worth, have had nothing but total respect for the brave, dedicated and yes... INTREPID, men (and now women) who serve in grey ships and submarines in bloody great oceans for months at a time! The Army was a fairly tough life in my day, and I'm sure it still is today, but bloody Pussers will always have the most profound admiration and respect! Just don't tell the bastards I said so! The golden rivett is a navy myth that in every ship there is a single hull rivett that's made out of pure gold to bring the ship luck. How about The Captain's Barnacle? Call it Red Lead after the ships cat of HMAS Perth.